As it is, the book is scarcely affordable: it weighs in at $314! But the publisher, E. J. Brill will put out a paper back eventually, hopefully in about a year, at a more manageable $45 or so, we hope. NB. We should also note that ETC bloggers are exceptionally well represented in this fine volume. NB. The one essay title not replicated in the second edition is the one by Bob Kraft on the Use of Computers in NT TC. I was surprised not to find any replacement of this important essay and topic and found the attempt to justify its absence in the preface rather unconvincing. But I gather in conference gossip that unsuccessful attempts were made to have an essay on this topic included. The omission of technology is disappointing, especially given the recent thrusts in this area by ITSEE, INTF, the VMR, and digitization of major manuscripts, just to name a few. I hope Dr. Ehrman is right and a $45 paperback is on its way! I would love to dive into this volume. Any librarian who weeds their collections well will tell you that writing on then-current technology is the surest way to date yourself quickly. All technology is "then-current" technology. Given the pace of technology, and for an update of a volume this influential, it doesn't surprise me that the matter of computer use was left out. Journal articles are a better place for that, because they're expected to have a shorter shelf life. That said, it'd be nice to see a series of journal articles on the topic, in place of said chapter! Rick, there is discussion of various aspects of technology throughout the various essays of the volume (as relevant to each chapter). So most of these items do appear in the index and can be chased up. I imagine most chapters will have notes to web-sites as well as print publications (although I haven't checked this out); and there are discussions of CBGM etc. (in Tommy's chapter). Thinking about it, it would be a difficult chapter to write. And that would appear to be what the editors found too. Mike Holmes told me they were hoping the paperback would be out in about 18 months. Matthew, I'm sure you are right. Interesting to re-read Bob Kraft's chapter in the 1995 book on the Use of Computers. This doesn't even mention the internet. In other respects it looks prophetic. Speaking of Brill, any news on Wallace's forthcoming work on our 1st century Markan fragment? I agree that technology changes rapidly. That said, it still seems that a piece on the subject representative of the time in which it was written would be helpful. I'm also thinking here of the introductory comments made by Parker in his SBL paper on the digital NA28 (cf. 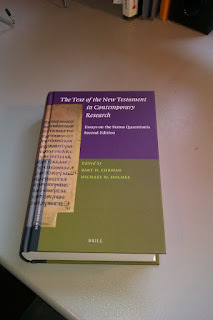 his "The New Testament of the Future" in Textual Scholarship and the Making of the New Testament). Ferdie: Brill will publish six papyri from the Green collection (at least one of which is not a New Testament papyrus). Initiallly, they were dated to the second century, but now, judging from presentations and other sources, it sounds as if they will be dated to the third century. The first century fragment of Mark is not among these six papyri. It is probably in the hands of a private collector. It was first mentioned by former affiliate of the Green Scholar Initiative Scott Carroll, who seems to have examined a private collection in Turkey and who twittered that he had identified the earliest NT papyrus so far without mentioning the content. Carroll was later fired from GSI for some reason. The papyrus fragment was also mentioned by Wallace in a debate, along with the other six papyri, so it is very likely that his information came from the same source (from the Green collection). However, the Green collection have explicity denied that they possess this fragment, which I think implicates that they were not able to purchase it, at least not at that time. I have not seen that Wallace is working on any fragment with his students. Mike Holmes, however, is working on a fragment och 1 Cor with two of his students, which was announced on his institutional webpages for some time ago. Then there were presentations at the SBL of tree other fragments, so two more are out there somewhere. You will shortly find the pre-print of my chapter on the Latin Fathers at http://eprints.bham.ac.uk/1268/.